In honor of St. Patty’s Day! How do I describe St. Pat’s Day at UMR (Univ. of MO.-Rolla) where my husband went to college and where I showed up for every St. Patrick’s day to help celebrate the holiday. Well, green food from the frat house, green mashed potatoes, milk, beer, all the guys sporting beards (or trying to – took my husband all year to grow one) and helping to build (or add the paper) to the floats that were all mechanical and unbelievable; but what would you expect from an engineering school. So, when bunco rolled around this month and the hostess said “think green” for St. Patrick’s Day my first thought goes back to Rolla and where we spent the first year of our married life; and I have to say, living next door to the frat house was fun, and I remember a few guys showing up all the time for food; I guess I have always liked feeding people. 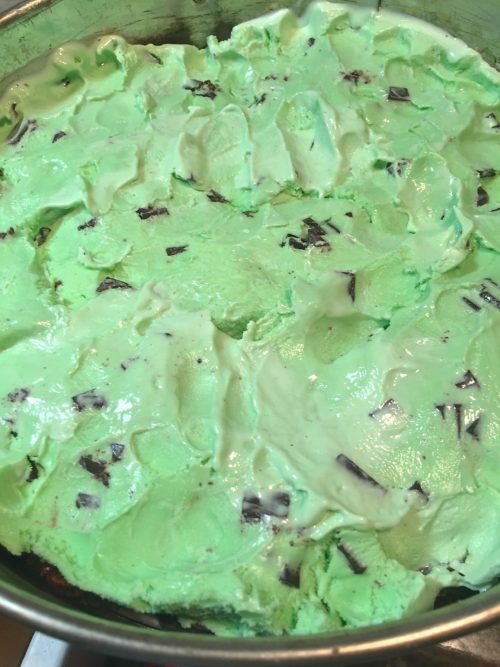 I signed up for dessert for bunco for March and thinking of something green was going to be a challenge because it needed to be a frozen dessert since I wasn’t getting back in town until the day of bunco. This dessert is so easy that I’m almost embarrassed to post it, but why not, and if you don’t want to make the brownies, just substitute a chocolate wafer cookie. This recipe using chocolate shell (I’ve made from scratch before but not this time.) is so much fun (if you can say that about a recipe). 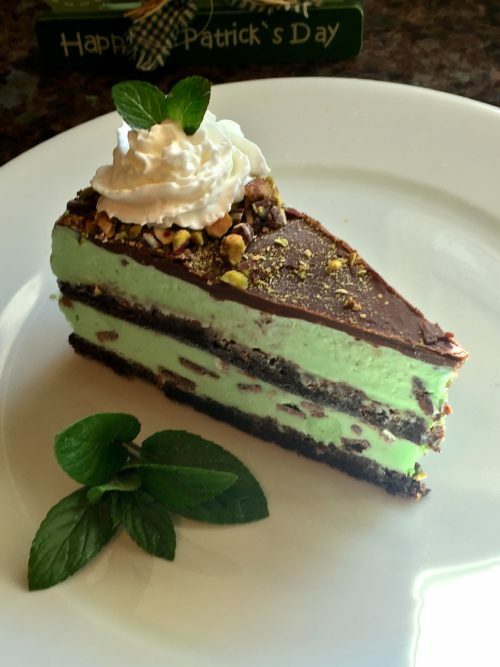 The liquid chocolate immediately turn to a smooth shell when quickly poured onto the top of the frozen dessert and quickly gets sprinkled with some chopped pistachios and Andes mint pieces. 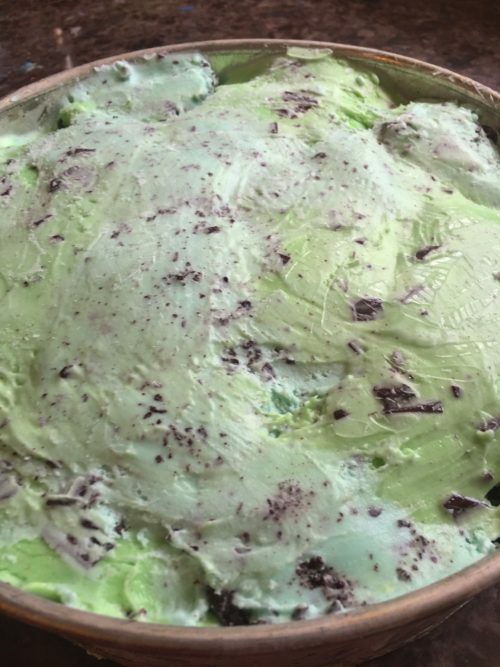 Pop it in the freezer and you will have a beautiful Mint Chocolate Chip ice cream dessert. (Afterthought — after using the magic shell it really hardened like it was suppose to on the top of the ice cream dessert and so it was a little hard to cut without cracking. I may use Hershey’s hot fudge sauce the next time – thick and it will stay softer to cut after frozen.) But, the chocolate shell looked so smooth on top and as you can see from the photos, it didn’t crack that bad. BLAST FROM THE PAST: Looking for a new breakfast treat? Try my Eggs Rothko, beautiful colors and great taste. 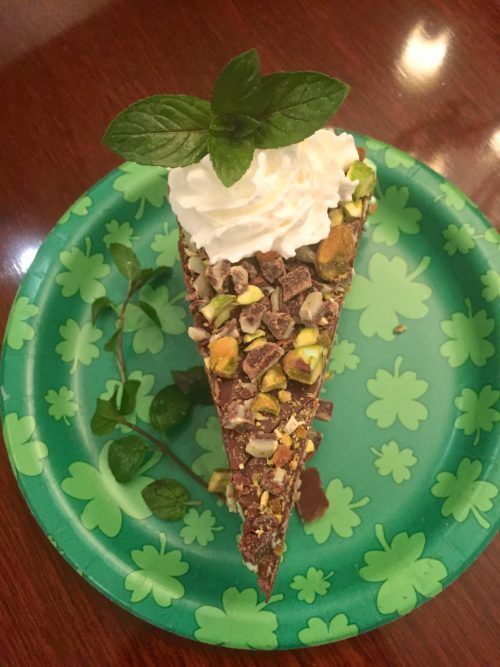 The way it was served at bunco last week. 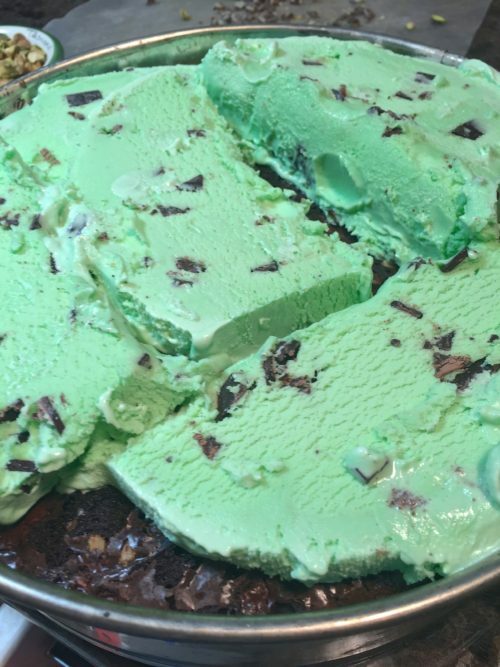 On the first layer of baked brown, top with half of the mint chocolate chip ice cream. 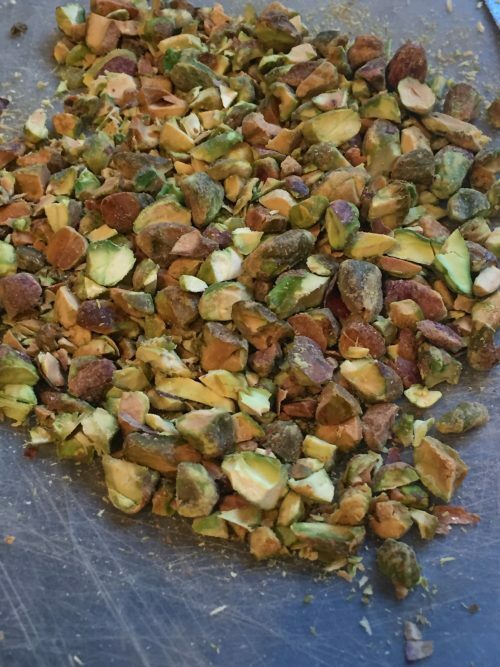 Have your Andes mint chips and pistachios ready to sprinkle because the chocolate shell will harden almost immediately. 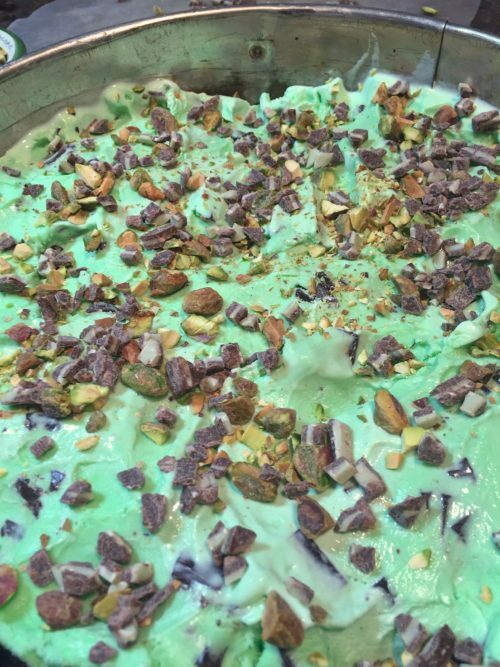 Sprinkle some of the chopped pistachios and the Andes mint pieces on top of the first layer of ice cream. Add another layer of brownie and then the rest of the ice cream. Smooth the ice cream to cover entire pan. Decorate with swirls of whipped cream, cut and enjoy. 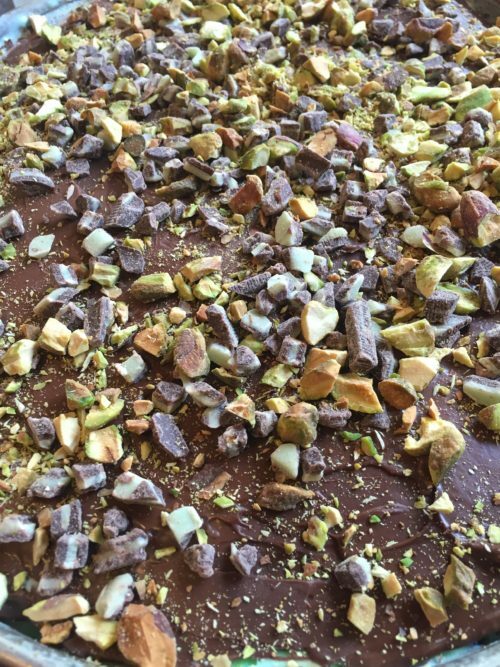 I put in the freezer at this point and the next day I took out and added the Magic Shell topping and quickly add the remaining pistachio nuts and more Andes Mint bits. You have to do this quickly or have someone help because the magic shell will harden very quickly. 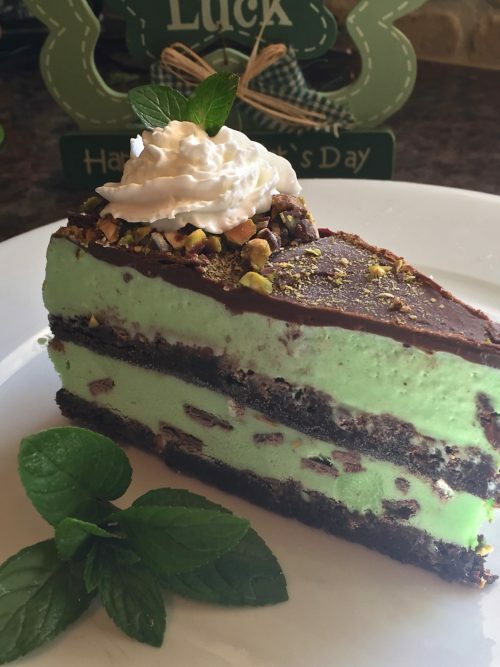 If you are using the hot fudge topping then you can easily take your time and spread it across the ice cream and then top with the nuts and mint bits. Freeze until solid, overnight best. When ready to serve, run a knife around the outer edge of the springform pan to release. Cut into slices and top with whipped cream and mint leaves for garnish. Instead of using the magic shell (which is fun to watch harden but hard to slice through neatly) I'm going to use a Thick Hot Fudge (do not heat) topping the next time and the nuts and mint bits will stick better and it will thaw nicely and cut a little neater. Delicious no matter how you make it. 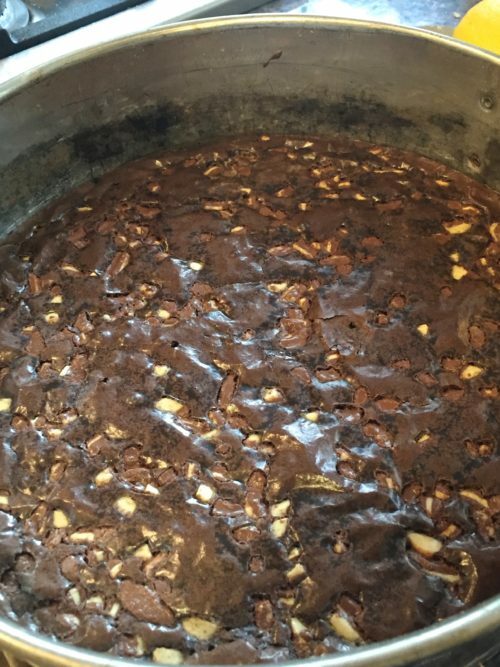 Instead of doing the brownie rounds like I did, just bake your brownies in a 9 x 11" pan and when they are baked and cooled, crumbled and divide in half for the two layers. Yummy. I tasted a little as I have to be careful with my A1C. It is Devine.